Below is another instance of notification -- in fact, the THIRTY-FIRST KNOWN VICTIM . . . and there are obviously MANY more. My name is David and I am unsure whether or not you can be contacted at this email or even if you are a real person. Regardless, I was lead to your blog by some unusual circumstances. I have been experiencing technical glitches in some of my electronics and even though I purchase top of the line security for all my devices and the internet that they use, yesterday I decided I would go a step further and update all of my software and run necessary checks, etc. I am a political operative by trade so I often have multiple things on my computers or other devices that are secret or confidential campaign or political material. I use the protective security software as a precautionary measure mostly. Regardless, upon reviewing my security stats I found that I had been attacked or at minimum an attempted attack, (but from what I'm seeing now it looks like it worked), from a specific IP address. I have traced that address back to an address in Potwin, KS. 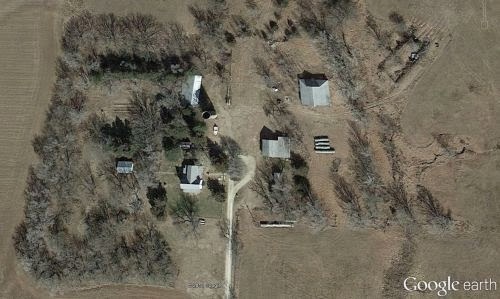 I eventually used Google Earth and Street View to gain a clear view of a spread out farm. I then simply googled the address and it led me to your blog. I'm not really sure what any of this mess is about but one thing I do know, mostly because I have a record of it. Is that someone at 8652 NW 120th St. Potwin, KS 67123 has violated my privacy in some way or another. I might be wrong but I would appreciate your input. Please keep this message private for now. Thank you.